Taking booking now for summer. We are open for winter hiking adventures too - send your hike plan and we will do the rest. 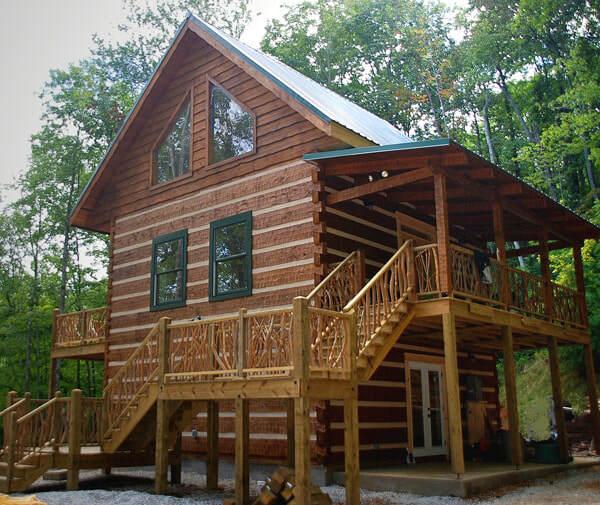 Get excited about your life, it’s time for you to stay at one of our one, two or three bedroom traditional Appalachian style, vacation rental log cabins. We specialize by taking ‘Natures Unique Design’ and recreating it inside our cabins; with custom tree stairs rails and furniture, that will delight and inspire. Privacy, romance and price is always a consideration for our guests, so we have allowed nature to wrap and shield our cabins, installed privacy fencing and included romantically lit hot tubs. All our cabins are located a short distance from the beautiful, tranquil and clear blue waters of Nantahala Lake, where a small lake community with a gas station, store, restaurant and marina is a wonderful addition, to what will be a fantastic vacation. We are located in the epicenter of the Nantahala National Forest in the Great Smoky Mountains, where excited vacationers are enjoying the thrills and spills of whitewater, zip-lining, horseback riding, fishing and exploring the many forest trails. We have quality, price and location to make that weekend, honeymoon or that thrill seeking family vacation very special indeed. Please contact us aquone.cabins@gmail.com or 828 321 9949 and let us take care of the rest.